New Student and Family Director Patricia Hilkert during Wildcat Welcome. NSFP and MSA have partnered this year to make NU more inclusive. Yasmine Diara is a seasoned Peer Adviser — 2018 was her third year leading activities during Wildcat Welcome, facilitating discussions and giving first-years much needed advice. This year, though, the Weinberg senior got to do the same things with other PAs as well. These extra sessions, called affinity groups, allowed students of color and students who identify as LGBTQ+ to connect outside the normal rush of PA training. Eager to try something new, Diara volunteered to facilitate the affinity group for black PAs. As colleges have become more diverse, administrators have struggled as students from these backgrounds have pushed them to focus more on creating an inclusive environment. 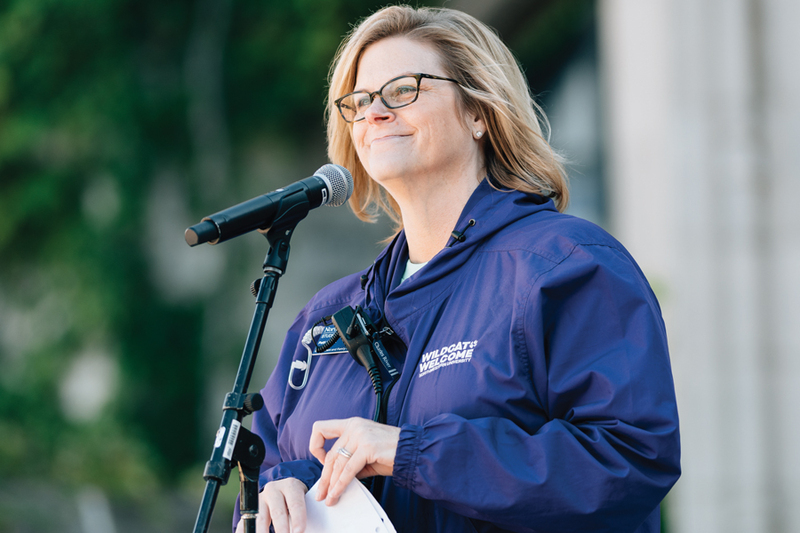 PA affinity groups are one of many ways New Student and Family Programs and Multicultural Student Affairs have been trying to present NU as a more welcoming environment to students of color this year, said NSFP Director Patricia Hilkert. The report, published in 2016, recommended the University adopt long-term goals like increasing the number of black students, faculty and staff at NU, to creating more spaces for black student organizations. This isn’t the first year the University has tried to be more welcoming. In the past, MSA, the Gender and Sexuality Resource Center and the Black House have all had open houses during Wildcat Welcome, Hilkert said. She added that NSFP is always looking for things to add, and that she’s been “analyzing it to death” to make sure the University is doing everything they can. In addition to the affinity groups, this year NSFP and MSA created a space for non-PAs to connect as well. The Students of Color Mixer, which took place during orientation, was implemented in hopes that non-white students could connect with one another in a fun and intimate space, Hilkert said. During Parent and Family Orientation, MSA and Counseling and Psychological Services also hosted sessions for families of students with salient identities — the sessions included information on how to best support students and challenges they might face. About 40 people came to each session, Hilkert said. In order to continue the work they started at the beginning of the year, Hilkert added, similar sessions were also held during Family Weekend, but did “not have the turnout” she hoped for. Sessions will continue next year, but only during Parent and Family Orientation, Hilkert said. Patricia Telles-Irvin, the vice president for student affairs, said she hopes the new programs will create a sense of community for students with traditionally marginalized identities. As for the effects of the new programming, Diara thinks NSFP and MSA have so far been successful. Diara also thinks both the University and the students could do more. After all, she said, this programming is only one step in the right direction. She added that she’d like to see both students and administrators be better allies to students with marginalized identities.